Deep-fried bananas are probably one of the most popular street food available throughout South-East Asia. There are so many versions of it; but, this unique bananas spring roll is so simple to make and tastes fantastic. It's known as Philippine’s Turon. 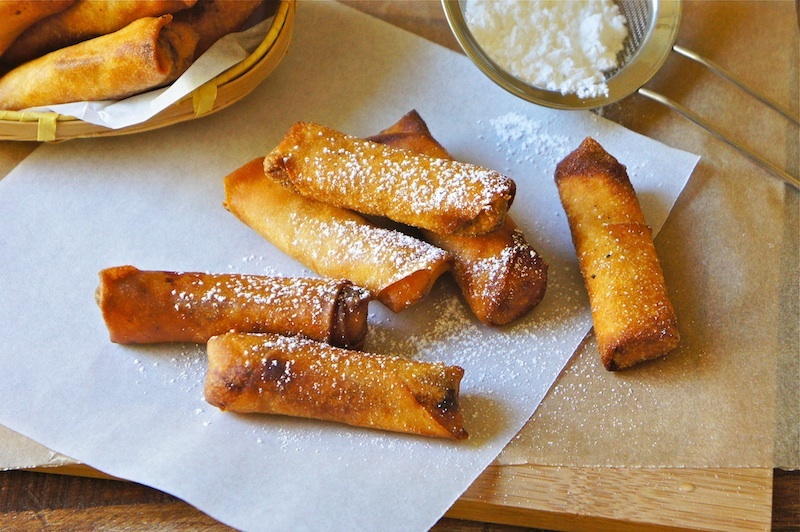 The spring roll wrapper is filled with banana, lightly sweetened with sugar, and deep-fried until it's crispy and golden brown. You can enjoy the Turon as it is or dust it with some confectioner’s sugar. Yum! Place the banana on the bottom third of the spring roll wrapper. Sprinkle some sugar on top of the banana. Wet the edge of the wrapper with water, fold, roll up, then fold in both sides and roll into a small cylinder. In a wok or a large skillet, heat 2 inches of vegetable oil to about 350˚F (180˚C). Test the temperature by carefully placing a spring roll in it. If the oil foams but not too vigorously upon contact, it is hot enough. Add the rolls without crowding, and fry until crisp and golden brown, about 5 to 6 minutes. Remove the spring rolls with a slotted spoon and drain on paper towels. Let cool slightly and serve warm with some confectioner’s sugar, if desired. Angie, this looks good :) I am going to try this out for sure. Thanks for sharing and have a great day. Looks fabulous! Will be making these this weekend while studying for midterms!